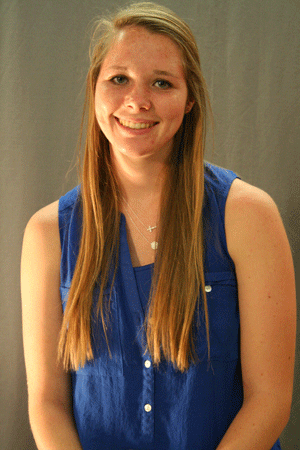 Hannah Twenhafel is an active student on Cowley College’s main campus in Arkansas City. The dedicated student and track athlete is well liked and respected by instructors and students alike. Her hard work and positive attitude was rewarded with her recent selection as the school’s September Student of the Month. “It means a lot to have the instructors recognize the little things I do,” Twenhafel said. The sophomore pre-pharmacy major from Nortonville, KS is the daughter of Rick and Chris Twenhafel. Grandparents are Ruby and Clarence Twenhafel of Oregon, and Robert Holloway of Michigan. Her older sister, Katie 21, was a member of the Tigerette Danceline and graduated from Cowley College in 2014. Her twin sister, Sami 19, is a current student at Cowley and is involved in band and Phi Theta Kappa. At Cowley, Hannah is a member of the track and field team, a Cowley Tutor, a student ambassador, Phi Theta Kappa officer, member of Chi Alpha, and a volunteer in the Science Department. Dr. Michelle Schoon, Natural Science Department Chair, has enjoyed the opportunity to work with Hannah in the classroom. Twenhafel often leads the group during lab work and volunteers her time to help in the lab room. “She is a valuable resource to the instructors as well as fellow students,” Dr. Schoon said. As a freshman member of the Lady Tiger track and field team Twenhafel placed sixth in the conference in the indoor and outdoor 60-meter hurdles, and placed in the top-six in the conference in the indoor and outdoor pentathlon. Twenhafel plans to attend the Kansas University Pharmacy School after graduating from Cowley. “I battled allergies when I was younger and have always wanted to be a pharmacist so I could help make people feel better,” Twenhafel said. In her goal of helping people, Twenhafel served a mission trip in Puerto Taxco, Mexico in the spring and plans to make a return trip each year. In her free time she enjoys reading and spending time at the lake. Twenhafel is glad she made the choice to follow her sisters, Katie and Sami, to Cowley. “Cowley has been extremely beneficial to me, it was definitely my best option,” Twenhafel said.